The room was really nice great to have all the amenities that came with the room such as kitchen, washer dryer, and the nice big tub. I did not like that noises can be heard from the room above and those adjacent. Noises can be heard as if they were in our room. The condo was great. It was spacious and comfortable. Everything was in excellent condition. The room was very well maintained. I was a little taken aback when I saw the bathtub out in the open in the bedroom though. I did, however, love the kitchen. Came in very handy. Liked staying in a spacious condominium. Felt like going home after leaving the strip. The room itself was fairly clean, but bed lumpy. External grounds were dirty and not well maintained. Parking is also hard to find. Have to fight for space. Rated as 3 stars but closer to 2 or 2.5 stars. Better to use a bit more money for a nicer venue. My 3 days stay the hotel overall was pleasantly nice. The suite room was spacious and felt right at home. I like that the place has a full-on kitchen. Checking in and out was quick and easy. Overall happy with the customer service. I ordered additional towels to be sent to the room and I was out of the hotel. I came back to find my towels waiting by my door and they also called to my room to follow up if I received the towels. I love that it is clean. So the overall stay made it worth while. Staying here from now on when I visit Las Vegas again. I enjoyed my stay but did not appreciate the severe pressure sales pitch. Grandview at Las Vegas places you within a 15-minute drive of popular attractions such as T-Mobile Arena and Raider Stadium. Each of the 2156 rooms at this 3-star condo building includes a kitchen, a living room, and a dining area. Each condo is air-conditioned and features a kitchen and space to spread out with a living room and a dining area. A TV comes with cable channels and a DVD player, and guests can stay connected with WiFi. The pillowtop bed provides a full night's sleep, and the bathroom offers a soaking tub, hair dryers, and free toiletries. Other standard amenities include a washer/dryer, free local calls, and a safe. Guests staying at Grandview at Las Vegas enjoy access to 5 outdoor pools, a fitness center, and 5 spa tubs. 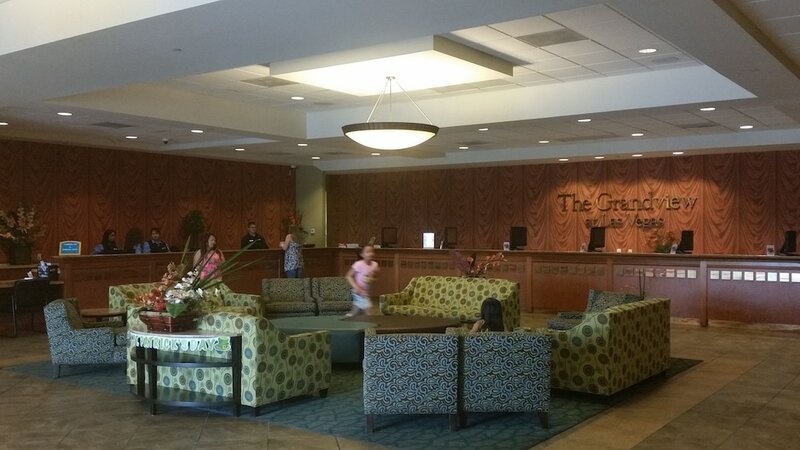 The front desk is staffed 24/7 to help with tours or tickets, and answer any questions about the accommodations. Additional amenities include WiFi in public areas, a seasonal outdoor pool, and coffee/tea in a common area. The condo has 5 outdoor swimming pools and 5 spa tubs. A seasonal outdoor pool and a fitness center are other recreation options. The front desk is open 24 hours a day, and checking in is easy with express services.